It doesn’t get any better than this! 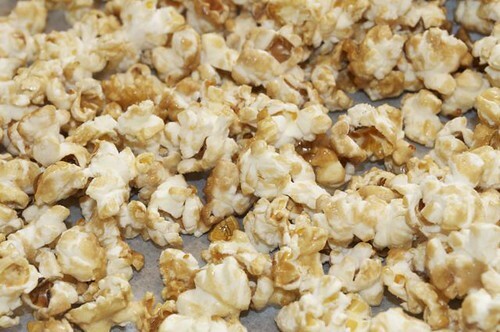 Popcorn, maple syrup, brown (and if you have it, maple) sugar, maple extract & salt. Talk about addictive. 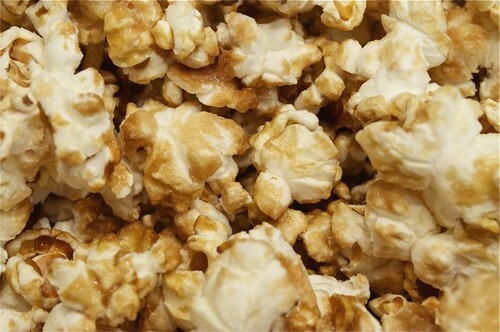 I make popcorn in the microwave using brown paper lunch bags, make the maple coating in a measuring cup, pour it over the popcorn, stir to coat and bake it for 15 minutes in the oven to crisp up. 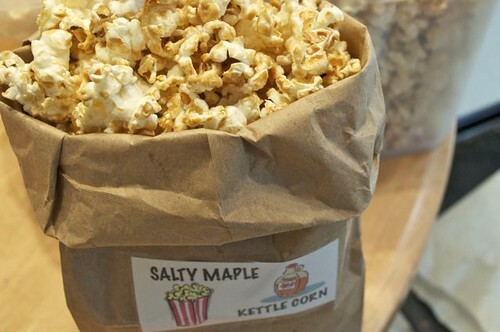 Often referred to as kettle corn – most recipes have oil, sugar and popcorn going at the same time in a pot on the stove – been there, done that, don’t like that, won’t do that! 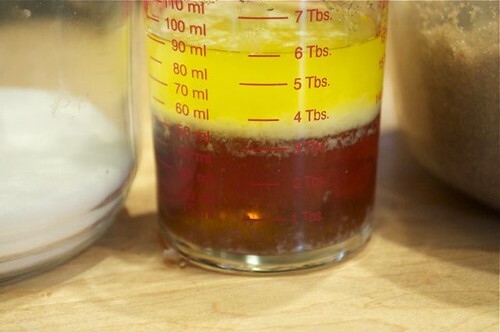 I much prefer this method as I can control the burning-sugar factor and I can make as much as I want … I’m sorry … need! So, make popcorn anyway you like and carry on – and when this is done, run and hide in the closet with your popcorn ’cause it will disappear faster than Chriss Angel on a work table! 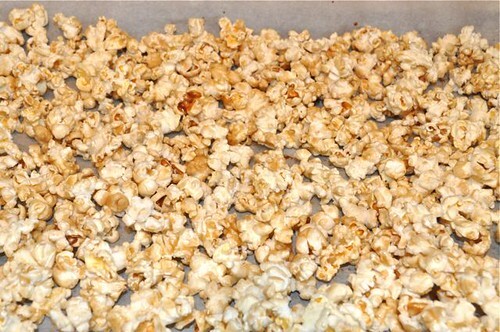 The recipe is for 2 bags of popcorn (1/4 cup each) in the microwave, so just start multiplying for bigger batches. 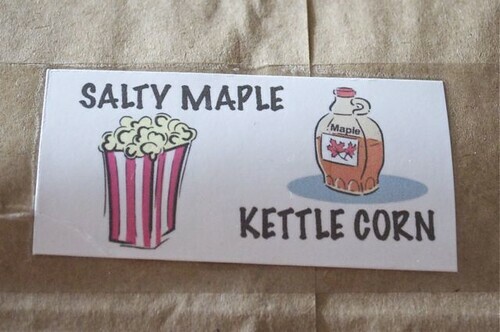 I’m making this for a bake sale, so I’m just gonna keep poppin’ – next, next, next – I got 30 bags of salty maple kettle corn, at 2 bucks a pop – don’t you just love fundraisers when you can actually raise some serious funds! I hate to say it, but beats a dozen cookies at 50¢ each! My feeling about bake sales is keep the purpose front & centre – to help the cause in a tasty way – now that’s sweet talkin’! So make it for yourself, make it for your family, or make it for a fundraiser – and this will be the start of a very beautiful friendship – you … and popcorn. 1. 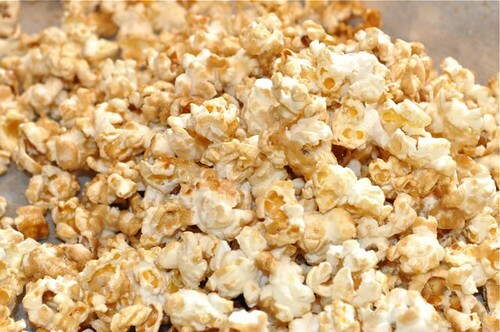 Pop yourself some popcorn – in the microwave, on the stove with no oil, or if you have one, an air popper! 2. 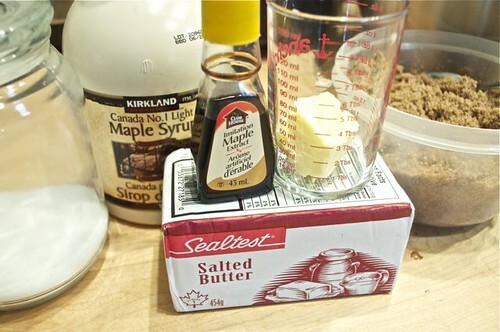 Gather the ingredients – butter, maple syrup, brown sugar, maple extract and salt. 3. I use a cup measure and keep adding to the same cup – saves on dishes and fussing. 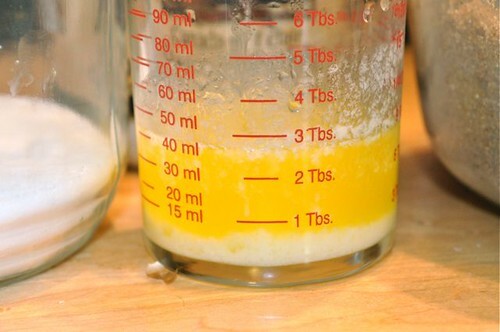 So melt the butter. 4. Add the maple syrup. 5. 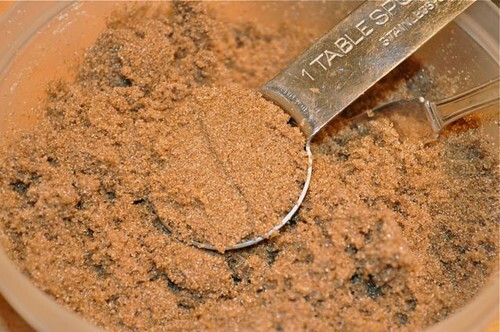 Measure the brown sugar. 6. 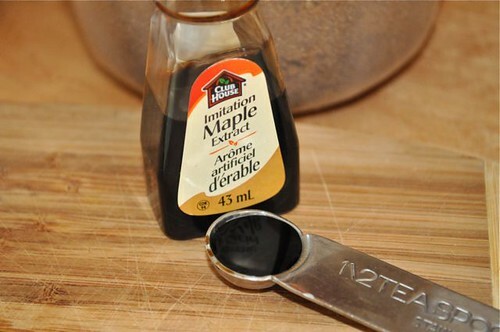 And the maple extract – and if you don’t have it, carry on without it. 8. Microwave for 10-15 seconds and give it a good stir. 9. 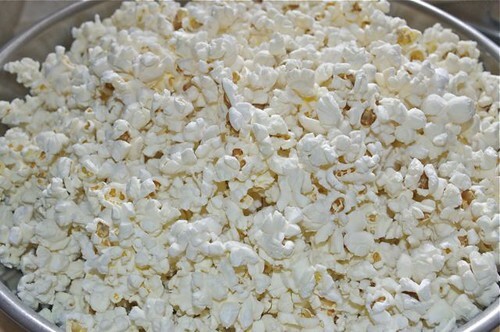 Measure out 8 cups of popped popcorn. 10. Drizzle on the maple coating. 11. 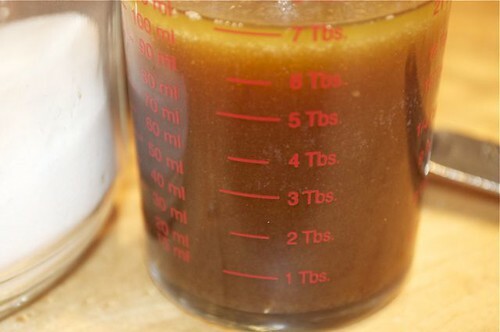 Stir well to coat evenly. 12. Transfer to a parchment-lined baking pan. 13. After 10-15 minutes in a hot oven – crispiness ensues. 14. Allow to cool before you dig in or bag for others. I’m bagging for others. 15. Got brown paper lunch bags and whipped up a label. 16. Bag 2-3 cups. fold over, staple closed and keep going ’til you’re all popped out! 17. Just keep baggin’ your bucketful! 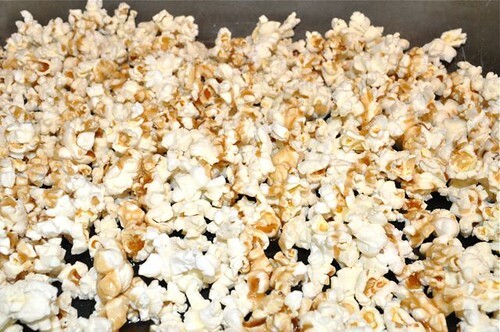 That’s what I do – after each batch in the oven cools, pick up each longside of parchment and funnel the popcorn right into the bucket like a water slide at Disney World. 1. Preheat oven to 350°. 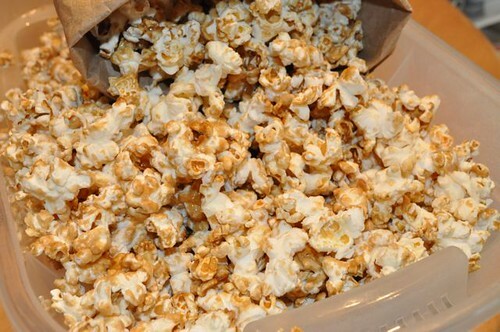 Following this recipe to make popcorn in the microwave, or if you’re using an air popper, pop 8 cups of popcorn. 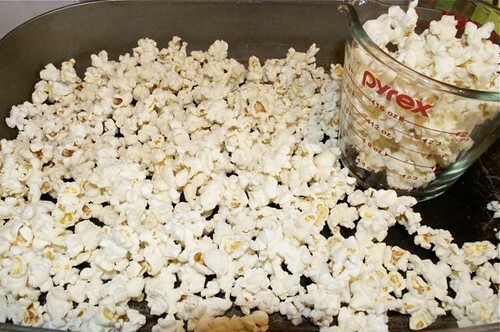 Place the popcorn in a large baking pan. 3. 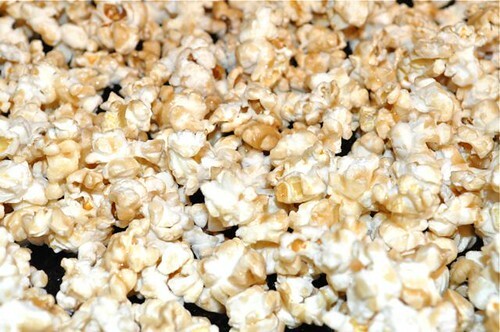 Pour over the popcorn and toss to coat thoroughly. 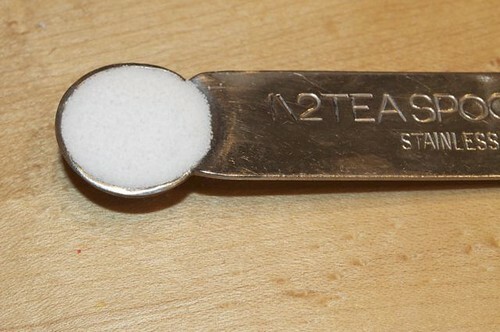 Finish with a sprinkle of salt from a salt ahaker. Put in the oven for 15 minutes to crisp. 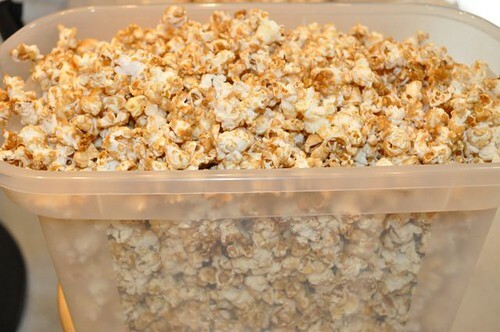 Pour into a large container and carry on making as much popcorn as you want. We are going to try this with our air popper, so wish us luck! Thanks for the recipe. We still love this recipe! !